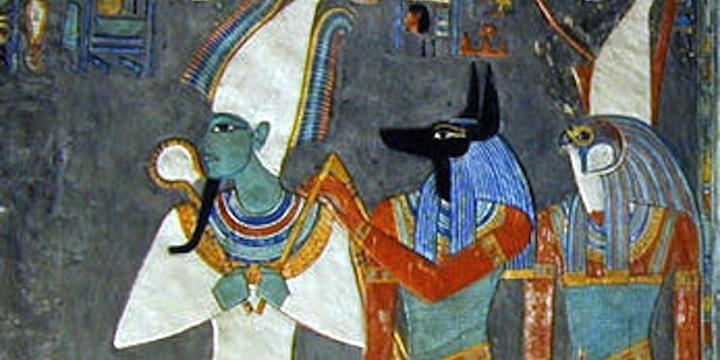 Egyptian gods Osiris, Anubis, and Horus (Wikipedia). Original photo of frieze in the tomb of Pharaoh Horemheb modified by A Parrot. Many sceptics claim the gospels are legends, similar to many other legendary tales of gods, and the legend of Jesus has grown out of similar legends of pagan gods. I have investigated what the experts say. It turns out the historians say that, for a whole range of reasons, the legends and rituals of pagan mystery religious could not and did not have a significant influence on the development of christianity. There were many religions and many gods in the ancient world. Many of them have been called ‘dying and rising gods’ because it is said that the legends about them include their death and resurrection. Examples include Mithras, Dionysus (Bacchus), Attis, Osiris, Horus, Tammuz, Adonis, Persephone and Orpheus. (Sometimes the same god appears under different names in different cultures and languages.) These religions were followed in Graeco-Roman world in the period of about 500 BCE to 400 CE, but the Egyptian myths of Osiris and Horus go back 2000 years before that. Around the beginning of the 20th century, some scholars argued that many of these features were common to many religions, including Jesus and early christianity. The same legends were simply adopted by christianity, they said, which should therefore be seen as another mystery religion. However, as scholars discovered more texts and artefacts, the parallels became less and less clear. By about 30 years ago, the majority of historical scholars no longer accepted that the parallels were real and significant. To my knowledge, only one recognised scholar (Robert Price) plus some other writers who are not recognised scholars, now believe the pagan religions have had any significant impact on christianity, though some scholars would see minor parallels. JZ Smith – Professor of Humanities at Chicago University, one of the most respected historians of religion and a recognised expert on Christianity and pagan religions. TND Mettinger – Professor emeritus, Lund University, Sweden, author of the definitive work on Christianity and pagan religions. Ronald Nash – formerly professor of Philosophy and Theology at several universities, and author of two books relevant to this discussion. Bart Ehrman – Professor at the University of North Carolina and author of many books. Edwin Yamauchi – Professor Emeritus of History at Miami University and author of many books on (among other things) ancient Middle Eastern religions. Few of the teachings are written down, for they were only revealed to initiates. Bart Ehrman: “we know very little about mystery religions – the whole point of mystery religions is that they’re secret! So I think it’s crazy to build on ignorance in order to make a claim like this”. The closest we get are legends of gods who ‘die’ every year in the dry season or in winter and ‘return’ or are born again with the rains or the spring harvest. Osiris/Dionyus was born on December 25th, but the Bible doesn’t mention 25th December and few suppose that was when Jesus was born. Adonis, Osiris/Dionysus, Horus, Mithras, Osiris and Tammuz were not born of a virgin as is sometimes claimed. Many of the legends only appear after the first century. Where this is the case, there obviously couldn’t be copying by christianity – in fact, this may indicate the mystery religions copied christianity. It is hardly surprising that a religion offers its followers salvation, or includes rituals resembling baptism or a ritual meal, nor that a god could perform miracles. The stories of the dying gods do take place at a known time, but are legends with minimal historical reference. Plutarch (46-120 CE) warns his readers against taking the Egyptian stories literally. But there is good historical evidence for Jesus and the gospels are recognised by scholars to belong the literature category of biography, not legend – see Are the gospels historical? and Was Jesus a real person?. The conclusion of the experts is almost unanimous. For a whole range of reasons, the legends and rituals of pagan mystery religious could not and did not have a significant influence on the development of christianity. There may have been minor parallels and influences, but nothing that explains the teachings of Jesus or his early followers. Jesus was a historical figure, whose life and death occurred at a known time and place, with eyewitnesses present, whereas the pagan religious had no such historical basis. The pagan gods were fertility gods who died every year in some ritual sense, but not in history, whereas Jesus died once in history for quite different reasons. It is therefore difficult to see how the factual events of Jesus’ life could be copied. In short, his life and death make sense within first century Judaism, whether one believes he was divine or not, and very little sense in a pagan context. Those who promote the pagan parallels are mostly using old, and now refuted, information, and interpreting historical facts in ways that scholars in the field think have little or no basis. Their arguments often depend on the assumption that Jesus wasn’t a historical figure, and the gospels have no historical basis, and the stories of Jesus are legendary, a view held by virtually no scholars these days. Many of the claimed parallels sound plausible when compared to ‘dying and rising gods’ in general, but fall apart when the comparison is made with any one of the gods. Even if the pagan parallels were shown to be correct, it need not throw doubts on christianity. Writing more than 50 years ago when the pagan parallels were still believed, christian scholar and writer CS Lewis saw the pagan beliefs as God’s myths and precursors of christianity. He believed that the resurrection of Jesus belonged in this category of myths, with the additional property of having actually happened. Jesus in history – what the scholars say we can know about Jesus. The reliability of the New Testament text – how it compares to other ancient documents. Are the gospels historical? – how historians evaluate the New Testament as history. Parallels between Christianity and ancient Pagan religions – Religious Tolerance (unfortunately this is not a very accurate site). Bart Ehrman’s blog – scroll down to the section on dying and rising gods.